The Lions went 0-16 … in 2008! That year doesn’t enter into our sample! Small consolation, especially since we’re looking at best seasons, but when I started I thought it was within the last 10 years and it made me sad. Anyway, the Lions are a team with exactly one playoff win in the Super Bowl era (over the Cowboys in 1991) and no division titles since 1993. In the last 10 years, the team has taken an NFC Wild Card three times, but lost in the first round of the playoffs all three times. It’s not an illustrious history. Let’s take a look at the best Lions fantasy seasons of the last decade. It shouldn’t come as a surprise that Stafford owns the top eight and nine of the top 10 Lions QB fantasy seasons in the last 10 years, with only Shaun Hill’s 2010, when Stafford was injured, replacing him. And while he was pretty steady for most of that run — from 2012 to 2017 he had between 250 and 291 points every year — his 2011 stands far above the rest as his career year, the only year he’s reached 5,000 yards or thrown more than 32 touchdowns. 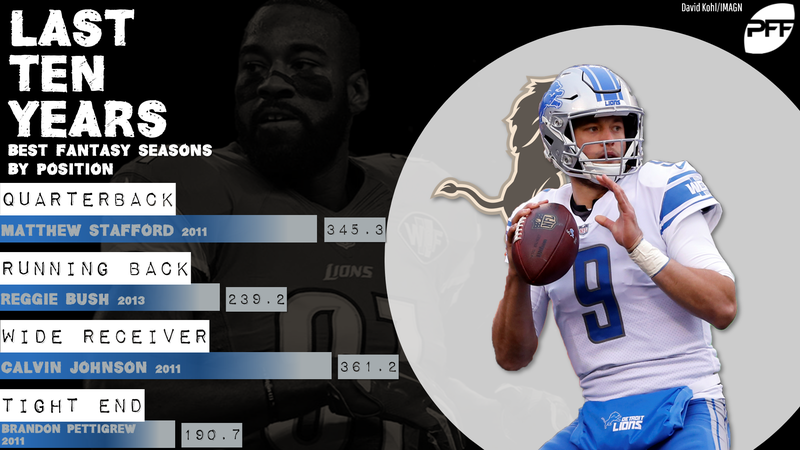 Stafford’s 2018 was his worst year since establishing himself as a starter, so maybe it’s ending for him, but that 2011 was a record-setter. Kerryon Johnson famously broke the Lions’ years-long stretch without a hundred-yard rusher last season, and while that in itself doesn’t mean much beyond a curiosity, it’s indicative of the subpar RB situation the Lions have put together in recent years from a single-back perspective. That said, Bush and Joique Bell made a good backfield combo in 2013 (and, to a lesser extent, 2014). They combined for 1,656 rushing yards, 1,053 receiving yards, and 15 total touchdowns. Get that out of one guy and that’s a record-setting year. Get it out of a duo, and … it’s good, but the end result is that no team has a worse “best RB season” than the Lions. This was one of the most predictable picks in this exercise, with the only question being which Johnson season would qualify. His 2011-2012 combo platter, with 3,645 combined yards and 21 touchdowns, will always be legendary, but because he got 16 of those 21 touchdowns in 2011, it edges out the later year, even though he had 280 more yards and 26 more receptions in 2012. Either way, he was really, really good. Every single person reading this who played fantasy back in the 2010 range, yes, even you, had at least one season where you missed out on the top tight ends and stumbled into Pettigrew late in the draft and said “Eh, fine.” Pettigrew is an anagram for “good enough, I guess.” (No it isn’t.) If this happened to you in 2010 or 2011, it worked out just fine, as Pettigrew was plenty productive for a late-round tight end. If it happened in 2009 or after 2011, it didn’t. That’s about the success rate you want from a super-late tight end.